Trail riding has become one of the most popular forms of mountain biking in the recent years. A trail bike excels in both climbing and descending and is a perfectly balanced bike that can handle most of the terrain you throw in front of it. No brand better embodies premium quality than Santa Cruz. They have been making some of the best and highly sought after bikes in the industry for many years now. The 2019 Santa Cruz Chameleon Aluminum R+ Bike is a highly versatile mountain bike that you can run with either 29" wheels or 27.5+ wheels. You can also run it geared or single-speed and can use either 120mm or 130mm of travel. The R+ build of the Santa Cruz Chameleon Aluminum features a SRAM NX Eagle drivetrain. This includes a SRAM NX Eagle rear derailleur, shifters, chain, and crankset. With SRAM Eagle components, riders can take advantage of the benefits of having a 12-speed cassette that has an outstanding 11-50 tooth gear range that makes climbing a simple task but doesn't sacrifice top end speed. When you're bombin' down the mountain, the SRAM Level T hydraulic disc brakes provide ample stopping power. The R+ build features 27.5x2.8" wide tires and WTB ST i40 rims laced to SRAM MTH hubs. These rims and tires are tubeless ready so riders can drop their tire pressure for a smoother ride and increased traction. The suspension is provided by Fox and their Rhythm 34 with 130mm of travel. Lastly, the R+ build features a Race Face Aeffect dropper post so riders will be able to seamlessly transition from climbing to descending with just the push of a lever. 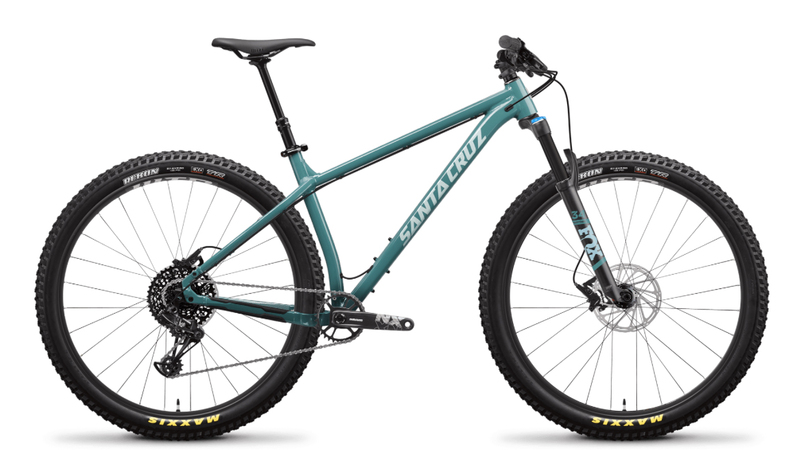 If you're looking for a hardtail trail bike that is loaded with features and able to change to adapt to its surroundings, then you'll love the 2019 Santa Cruz Chameleon Aluminum R+ Bike.